I’m just returning from a trip with my family that gave us countless opportunities to wait. Just when I’d be about to pray for patience, I’d rethink it, because I’ve often found that God answers that prayer with more opportunities to practice the virtue. The kids were great at keeping themselves amused with games, one of their favorites being “Would you rather.” Would you rather eat a fried cockroach or a snake? Would you rather pull out your eyelashes or toenails? Would you rather be sleep deprived or be desperately thirsty? You get the picture. And this is my answer: “I would rather eat macaroons in Paris, fly first class, get my nails done, and sleep under fresh sheets that smell like lavender.” Always. There isn’t a time when I would rather suffer or deny myself of something pleasurable. And here comes Lent, a season that asks me to change my perspective on what I truly prefer, deep down. Given the choice, I avoid an itinerary of dry lands, wilderness, or thick darkness. Yet in the depth of my soul, what I desire most is spiritual maturity. And in my experience, that kind of growth has always come out of the harsher landscape. What circumstance in your life looks like a desert or a wilderness? What landscape are you looking at that appears devoid of life or hope? Which prayer have you faithfully prayed, yet the answer has not yet come? Are you still slogging through the dry land, hoping that the oasis is just around the corner, but wondering if you’ll faint before you get there? The hardest wilderness experiences for me have not actually been my own. They have been the ones that I have watched my children walk through. Pitfalls have surrounded them, fear has paralyzed me, and the reality of how little control I have has threatened to take me out at the knees. Complicating matters is the fact that I have had a plan that would fix everything, if God and all parties involved would just cooperate. But life has a way of slipping out of our control, and this is guaranteed to happen on the road of motherhood. Recently, I have watched my child move into a place that I have spent years convinced would spell disaster. It seemed to me to be the exact opposite of the environment I had prayed for. Fear robbed me of sleep, and worry upset my stomach continuously. Who knew what God had up His sleeve. There is not a prayer I have prayed that God has ignored. Every tear I have shed has been stored up and acknowledged. He has not been asleep on the job. What I have called the wilderness, God has decided is the perfect place to split the rock open and answer my prayers. 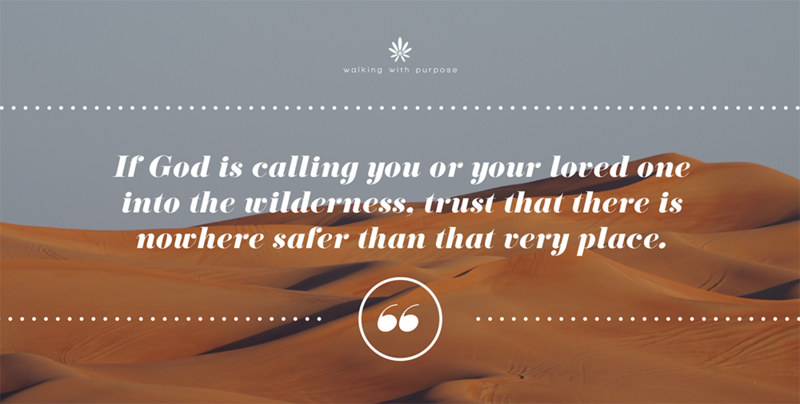 If God is calling you or your loved one into the wilderness, trust that there is nowhere safer than that very place. Certain things will be put to death there, and some of those things might seem very innocent to us. We may try to justify to God why it’s possible for us to keep them and still follow Him. Can we trust that He knows better? How painful the process is will have much to do with how much docility we offer the Lord. Sometimes it really hurts when the rock is split open in the desert, but the refreshing, healing waters will come. This Lent, let’s allow God to have His way with us. May we follow His lead, and trust that it will not be for our destruction, rather, for our glory. (1) C.S. Lewis, The Great Divorce (HarperCollins, 2009), pp. 106-112.